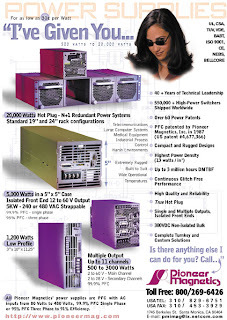 Since 1957, Pioneer Magnetics, Inc. has been in the business of designing and manufacturing a significant quantity of standard as well as custom features and options for the ac-dc power supply industry. 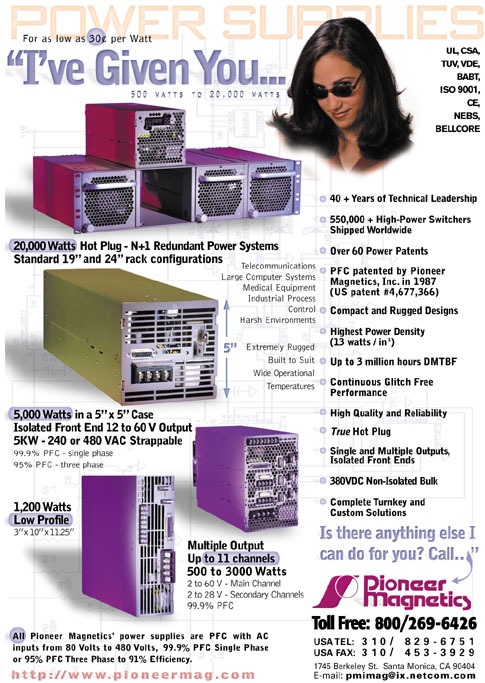 Over these years, Pioneer Magnetics, Inc. has reached out to its customers and provided a variety of needed value-added and contract manufacturing services. Pioneer Magnetics, Inc. costing structure is extremely competitive as compared to the more traditional contract manufacturing companies. Offshore support is also available. In the field of contract manufacturing, Pioneer Magnetics, Inc. strives to offer a Total Solution within the parameters of Total Quality Management (TQM). Your best choice is to contact one of our AC-DC power supply sales engineers by calling - 800-269-6426 or visit our AC-DC power supply catalog on line today.